At the Burj Al Arab, every guest is treated like a VIP. Your experience starts when a BMW or Rolls-Royce picks you up at the airport. If that's not your style, you could opt for a helicopter transfer right to the hotel's own helipad. The suites – furnished in royal blues, deep reds, and rich golds – boast all the luxuries that you could require, including jacuzzis, spa baths, private cinemas and even you own personal butler. Atlantis - The Palm Dubai is proudly outlandish. 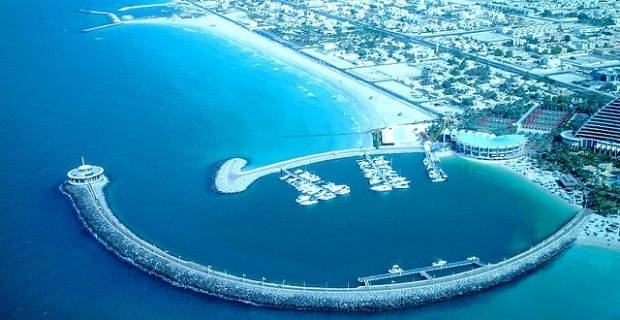 It's set on the man made island of Palm Jumeriah, and offers sweeping views of the azure waters of the Arabian Gulf. Each guest room and suite is designed with tastefully subtle oceanic and Arabic influences. The Grosvenor isn't as garish as most of its neighbours, but it remains proudly high end. There are 422 sophisticated rooms, 12 stylish restaurants and eight acclaimed restaurants that offer cuisine from across the globe. Service here is second to none. The Shangri-la Hotel chain is associated with luxury and premium locations the world over, and this Dubai hotel is no exception. Don't miss the world class spa on the ground floor. The creamy milk-and-honey wraps and rich caviar facials are particularly recommended. Fly to Dubai for a three-night stay in a four-star hotel for the price of a staycation.